E.O. Smith High School lost its bid to advance in the 1985 state tournament, having used its top pitcher, Brian Specyalski, the game before, according to The New London Day. Smith head coach Jim Parmelee explained the pitching rotation to The Day after the loss. "We had to pitch our ace (Specyalski) Wednesday against Windsor Locks," Parmelee told The Day, "because if we didn't win that game we wouldn't be here." Specyalski went on from Smith to play at the University of Connecticut and in the pros. His pro career, however, ended up being limited to just two seasons. He never made AA. Specyalski's career began in 1989, taken by the Angels in the 20th round of the draft out of Connecticut. At Smith, Specyalski threw a four-hitter, striking out six in a May 1984 game. He made the move to hitting at Connecticut. By the time he finished at the school, he owned the career hits record, though he's since fallen out of the top list. His .340 career average is still good for 15th all time. His 60 stolen bases are still seventh. Specyalski started with the Angels at short-season Bend. In 54 games played as an infielder, he hit .262, with five stolen bases. He went 1 for 3 in an August game, getting caught stealing in the process. He singled and scored in another game that month. 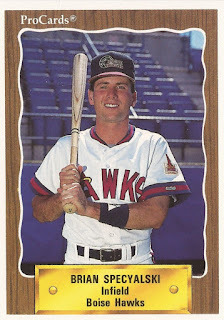 He then returned for 1990, playing at short-season Boise and single-A Quad City. Between them, he got into 31 games and hit .217, ending his career.